Join us at Happiness & Its Causes 2019 for a rich and inspiring experience, connecting with like-minded delegates and speakers. Explore the big questions in life and uncover what will bring lasting, genuine happiness for you, those you love and those in your care. It is equally relevant to individuals and professionals. Bring your whole family or work group to this inspiring event! Enhance your conference experience with Platinum Seating. Take up the Platinum Seating option and enjoy guaranteed seating in an area close to the stage. With Platinum Seating, you will enjoy the best sight lines and a more intimate view of our special guests on stage. This option can be added to any 2 day conference package. Located in The Gallery, Level 2, International Convention Centre, Sydney. The Wellness Show is Australia’s premier showcase of the solutions and technologies in fitness, health and nutrition, preventative health, education, psychology and more. This free event is co-located with Happiness & Its Causes and features an exhibition of innovative companies, free interactive seminars, yoga, laughter yoga, wellness bookshop, meet-the-author sessions and more! Bring your friends and your work colleagues. Meet at the show and share the atmosphere of the world’s premier health and wellbeing event! Automatic entry for conference delegates! When/Where Will the 2018 Happiness & Its Causes Conference be held? The 2018 Happiness & Its Causes Conference will be held in the Darling Harbour Theatre, International Convention Centre Sydney, June 25 – 26. 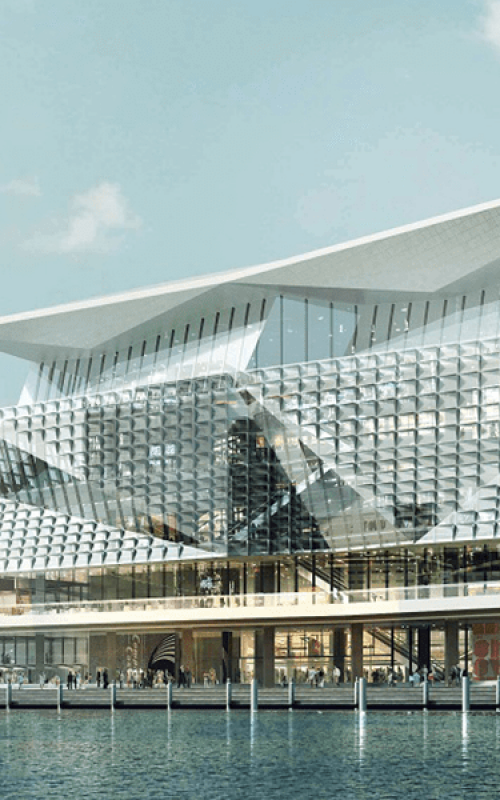 Where Is The International Convention Centre Sydney Located? The International Convention Centre Sydney is located in the heart of Darling Harbour and is easily accessible by public transport, including light rail, ferry and train and is only a 10 minute walk from Central and Town Hall train stations. Secure car parking is available and conveniently located within the Darling Harbour precinct. ICC Sydney has multiple public access points with step-free access to every entertainment, exhibition and conference venue. For more public transport information, please click here. ICC Sydney operates two 24-hour car parking stations with a total of 826 parking spaces including 12 disabled parking bays, 25 motorcycle parking spaces, 50 bicycle racks and 20 electric car charge spaces. For more parking information and parking rates, please click here. The action packed program is designed to suit individuals and professionals in health care, education, psychology and mental health, business and more. Motivate yourself, your work colleagues and your organisation – bring your whole team to this inspiring event! Group discounts are available. Email conferences@viconferences.com.au for more details. What Times Will The Conference Start And Finish? The 2-Day Conference will run from 09:00 – 17:30 on both days. Please allow plenty of time prior to the start of the conference for registration (Day 1) and security screening (Day 2) when the Dalai Lama will be onsite. The Pre-Conference Masterclass will run from 09:30 – 16:30 on Sunday 24 June 2018. The morning workshops will run from 09:00 – 12:00 and the afternoon workshops will run from 14:00 – 17:00. Please note that these timings are subject to change. Delegates will be notified of any changes. What is included in the Gold Pass? Enhance your conference experience by taking up the Platinum Seating option. Enjoy guaranteed premium seating in an exclusive area close to the stage during the two conference days. To add Platinum Seating to a 2 Day Conference Package, log on to your registration here, go to ‘edit sessions’ and select the Platinum Seating option. You will then be prompted to make payment for the outstanding amount. Full payment must be made prior to the start of the conference. Morning tea and afternoon tea are included in the conference fee. Lunchboxes can be pre-purchased for days 1 & 2 of the Happiness & Its Causes Conference and will be available for delegates to collect in The Gallery where The Wellness Show will be running. To pre-purchase a lunch box, log on to your registration here, go to ‘edit sessions’ and select the lunch box option. You will then be prompted to make payment for the outstanding amount. Full payment must be made prior to the start of the conference. Alternatively, delegates can purchase lunch at the pop-up café in The Wellness Show or at the many food outlets in the Darling Harbour area, which is within easy walking distance. If you have any special dietary requirements, please note them in your registration. We will endeavour to cater to dietary requirements listed, however it is not guaranteed. VI Conferences is not a Registered Training Organisation, however, delegates are still able to claim Professional Development Points through their relevant professional organisations by attending the main 2 day conference as well as the Pre-Conference Masterclass and Post-Conference Workshops. Attendance Certificates can be provided upon request post-conference. Happiness & Its Causes would not be possible without the invaluable work of volunteers. We are always in need of personable, friendly and of course, happy volunteers to assist on this incredible event. If you are interested in volunteering, please register your interest here and we will contact you once we start our recruitment process in March 2018. When Will I Receive My Entry Ticket? Your ticket for the Happiness & Its Causes conference can now be accessed and printed off by logging in to your registration and clicking on the [print ticket] link. If you have made any changes to your registration i.e. added additional sessions, your online ticket will update automatically. Please make sure that you print off your most up to date ticket and bring it to the conference so that it may be exchanged for your delegate name badge. When you register online, you can select to pay via credit card. We accept Visa and Mastercard. If you are paying an invoice via credit card or would like to pay via cheque or EFT, please call (02) 8719 5118 to process the payment. Can I Send Someone In My Place Instead Of Cancelling? Yes, you can. Please contact conferences@viconferences.com.au to organise a substitute delegate. Why Do I Keep Receiving Payment Reminders When I Have Paid? Payment reminders are sent when there are amounts owing against a part of your registration. If you paid by EFT, please email your remittance advice to conferences@viconferences.com.au. If no remittance advice is received, it is possible that we have been unable to match your payment to your registration. Please contact the conference office on (02) 8719 5118 if you are having any troubles with payment. Can I Buy A One-Day Ticket For The Conference? Usually not, however if the event isn’t sold out, we might be able to accommodate such a request, so please check in with us early May and we’ll see what we can do. Can I Attend Just A Workshop? Yes, you can attend a workshop only. All workshops can be booked separately and are available from as little as $270 + GST. Tickets for either the Pre-Conference Workshop or Post-Conference Workshops can be purchased here. When/Where Will the 2019 Happiness & Its Causes Conference be held? 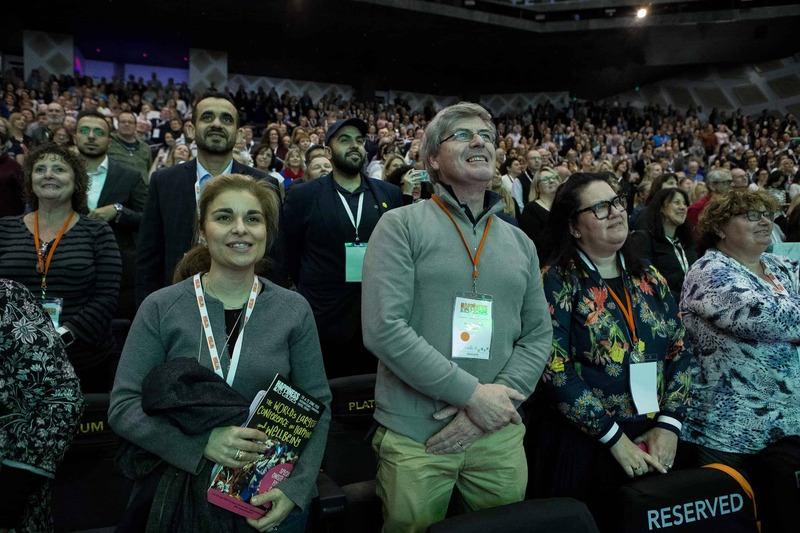 The 2019 Happiness & Its Causes Conference will be held in the Darling Harbour Theatre, International Convention Centre Sydney, June 24 – 25. The action packed program is designed to suit individuals, professionals and organisations interested in health care, education, psychology and mental health, business and more. The Gold Pass is the 4-day package, which includes the 2 day conference on Monday 24 and Tuesday 25 June, the Full-Day Pre-Conference Workshop, on Sunday 23 June plus your choice of one morning and one afternoon Post-Conference Workshop on Wednesday 26 June. With Platinum Seating, you will enjoy the best sight lines and a more intimate view of our special guests on stage. Platinum Premium seating is only available during the 2 Day Conference. To add Platinum Seating log on to your registration here, go to ‘edit sessions’ and select the Platinum Seating option. You can pre-purchase lunchboxes for both days of the conference. To pre-purchase a lunch box, log on to your registration here, go to ‘edit sessions’ and select the lunch box option. Full payment must be made prior to the start of the conference. If you have any special dietary requirements, please note them in your registration, as the ICC endeavours to cater to all dietary requirements. What time will registration open? Morning tea and afternoon tea are included in the conference fee. Lunchboxes can be pre-purchased for days 1 & 2 of the Happiness & Its Causes Conference and will be available for delegates to collect in The Gallery where The Wellness Show will be running. You will receive a link to your ticket for the Happiness & Its Causes conference in your automated ‘Completed Event Registration’ email as soon as you complete your registration. It can also be accessed by logging in to your registration and clicking on the [print ticket] link. Your username is your email address and you can create a password by clicking on the Forgot, or don’t have a password? Please make sure that you bring the most up to date ticket to the conference so that it may be exchanged for your delegate name badge at the registration desk. You can bring a printed ticket or a digital version on your phone/tablet. An automated ‘Completed Event Registration’ email is sent out to you as soon as you complete your registration. This email has links to your tickets, your invoice/receipt and details of how to login to your registration to make changes. If you cannot see the email in your inbox please check your junk or spam folder. If you have still not received the email, please email conferences@viconferences.com.au for assistance. When Will I Receive A Copy Of My Invoice/Receipt? You will receive a link to your invoice/receipt for the Happiness & Its Causes conference in your automated ‘Completed Event Registration’ email as soon as you complete your registration. Or it can also be accessed by logging in to your registration and clicking on the [print invoice] link. Your username is your email address and you can create a password by clicking on the Forgot, or don’t have a password? Yes, you can attend a workshop only. All workshops can be booked separately and are available from as little as $200 + GST. Please go to conference registration page and click the Buy Tickets button and you will be able to book individual workshops. I have a ticket to Happiness & Its Causes, can I attend some of the Workplace Wellness Summit sessions? The Workplace Wellness Summit and the Happiness & Its Causes conference are co-located events. However, you will not be able to enter the Workplace Wellness Summit with your Happiness & Its Causes ticket. When you register online, you can select to pay via credit card. We accept Visa AMEX, and Mastercard. If you are paying an invoice via credit card or EFT, please call (02) 8719 5118 to process the payment. I Purchased A 4 Day Gold Pass In Advance, How Do I Select My Preferred Post-Conference Workshops? You can select your preferred post-conference workshops by logging in to your registration here. Your username is your email address and you can create a password by clicking on the Forgot, or don’t have a password? You can make changes by logging on to your registration here . Your username is your email address and you can create a password by clicking on the Forgot, or don’t have a password? You can pre-purchase lunch boxes, make name changes or purchase platinum premium seating.